Dr. Hoh Kim is a Consultant for Conversant’s Asia Pacific office based in Seoul. He is also the founder, head coach, and lead facilitator at THE LAB. Hoh’s mission is to reimagine the way executives communicate with customized workshops that emphasize exploration and play. He has collaborated various artists including actresses/actors and jazz musicians to creatively approach leadership and organizational culture in the digital age. With over 20 years of experience at the upper echelons of public relations, communications, and crisis management, he has learned that influence, insight, and interaction are the cornerstones of leadership in the digital age. As a sought-after executive communication coach, Hoh draws from a vast supply of wisdom, gathered at universities in Korea and the United States, through Cialdini Method and Marshall Goldsmith certification programs, and from many highly productive years at Edelman—the world’s largest independent PR firm—where from 2004 to 2007 he led the Korean office to record revenues. Hoh has authored multiple titles, including Cool Survival Kit and Reputation Society. 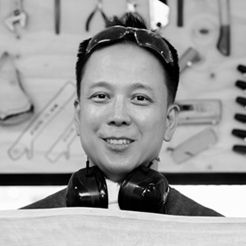 He lives in Seoul, Korea where he runs his own woodshop, writes, and guides high-level executives from around the world to find their most persuasive voices.